Vaslav Nijinsky’s jump was legendary. Asked to describe how he managed to jump so high he is reported to have said, ‘It’s easy. You go up and then pause a little up there.’ The only known visual evidence of Nijinsky’s dancing is contained in some extraordinary photographs taken at the height of his dancing career between 1909 and 1913 which dance critic Edwin Denby wrote, ‘in their stillness…have more vitality than the dances they remind us of…’ They also speak of a quality the artist Alexandre Benois evinces in his memoirs: having described Nijinsky as ‘of uninteresting appearance, rather short of stature with a thick neck and a large head’, he went on to write that ‘having put on the costume, he gradually began to change into another being, the one he saw in the mirror. He became reincarnated and actually entered into his new existence, as an exceptionally attractive and poetical personality.’ Evidently these photographs, and the personality portrayed in them, hold a powerful fascination for Company Chordelia’s artistic director, Kally Lloyd-Jones; Nijinsky’s Last Jump is her response. Much has been written about and much edited out of Nijinsky’s stage life and his relations with others — notably with Serge Diaghilev and with his wife Romola — but Lloyd-Jones has set out to reveal Nijinsky in his own right. In 1919, at the age of 29, he was diagnosed with schizophrenia and in the same year he wrote a diary over a six-week period that has become the only window into his inner life at the time. It was first published in 1936 in his wife’s carefully edited version, but in 1999 the original unexpurgated text was translated by Kyril FitzLyon. It is this version that informs Michael Daviot’s text for Nijinsky’s Last Jump which Lloyd-Jones has directed and choreographed. Following his diagnosis, Nijinsky lived another 30 years in the shadow of his fame, never again dancing in public and at the mercy of early 20th-century understanding and treatment of his disorder. Lloyd-Jones can’t resist the temptation to wonder what might have happened if schizophrenia had been better understood in 1919. Nijinsky’s Last Jump imagines a lucid dialogue between Old Nijinsky (James Bryce) and Young Nijinsky (Darren Brownlie) in which the two halves of a life divided by illness are reunited. The only occasion in the south of England to see this work is at the North Wall Arts Centre in Oxford. Given that Judith Mackrell ranked it fifth in her top ten dance works of 2015, it’s a mystery why Nijinsky’s Last Jump has not been invited to London (8 of her 10 choices were seen there). Kudos to North Wall. It’s a lovely theatre, too, with a seating capacity of 200 and its stage tonight has, thanks to set designer Janis Hart and lighting designer Laura Hawkins, become Nijinsky’s dressing room with a table loaded with bouquets of flowers and a mirror that together suggest a shrine. A screen in one corner is the changing area (rather improbably with Nijinsky’s name stencilled on it) and in the opposite corner is another screen reminiscent of a hospital bay. 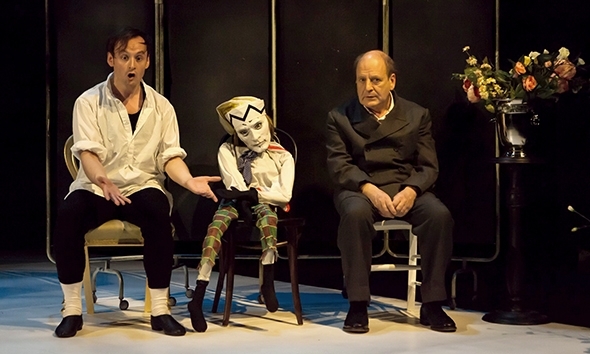 A Petrushka puppet (courtesy of Janis Hart) is draped on a chair. Seated next to the puppet Bryce, in a convincingly Slavic accent, introduces an anecdote about the origins of his famous jump while we hear the latter part of a performance of Le Spectre de la Rose taking place beyond the wings. All we see of the famous final jump is Brownlie landing in a heap on his dressing room floor, breathing heavily. Bryce becomes the regisseur, getting the younger dancer wiped down with a towel and returning him to the stage to acknowledge the rapturous applause (recorded as part of the sound design by Jesse Godolphin). Seated once again, Bryce talks dispassionately of his early preoccupation with masturbation. This is one of the details Romola had excised from the original diary, but its inclusion here not only allows Nijinsky to unashamedly confess his former sexual proclivities but alludes directly to the suggestive final pose of his first choreography, L’Après-midi d’un Faune (‘The Faun,’ he wrote, ‘is me.’). This clever cross-referencing in text and details is key to the richness of Nijinsky’s Last Jump and while Lloyd-Jones mines the roles of Nijinsky to find the person, she wisely avoids any attempt to find the dancer: Brownlie warms up in the dressing room but Nijinsky’s stage performances remain beyond the wings in our imagination.